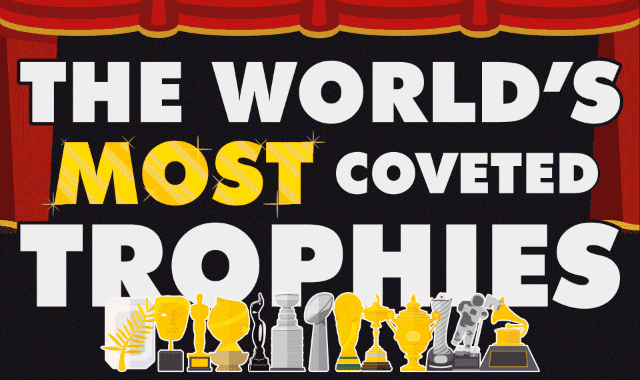 The World’s Most Coveted Trophies #Infographic ~ Visualistan '+g+"
Awards season is in full swing with actors, musicians and sports people battling it out to get their hands on coveted trophies in their fields. Many of these trophies, such as the Oscar, BAFTA and Grammy, will be imprinted on your mind due to their distinctive designs. However, have you ever wondered what these trophies are made from, or how much they weigh? This latest infographic uncovers all this, and much more, such as the value of the trophy if its weight related to solid gold or silver, as well as surprising facts about each trophy.